Do you know the one simple thought that will powerfully change your life? It’s short, it’s sweet, it’s easy to remember, and you can even re-craft it to use words that work best for you. Well, believe it or not, there’s actually more than one simple thought that fits this exact description, and there’s more than one simple thought that can dramatically change your life. So for today, we’re just going to focus on one, and this one comes in the form of a question. A reason for focusing on this one question now is that it’s particularly applicable to the recent How to rewrite your story, unlock your life post, though it reaches far beyond that as well. So, what’s this one simple thought that can change your life? You’ve likely encountered this phrase at some point, yet may not have recognized how incredibly powerful it is. Like many of the most powerful tools we have, the simplicity of this question obscures its power in plain sight, and leads us to often cast it aside. So, as you read this powerful thought, be sure to approach it with a fresh mind, and remember it’s power lies less in the words it’s composed of, and more in the action and intention you put into it. How can I see things in a different way? How can I change my perspective? How can I take my current circumstances and see them as providing me something good? You might also recognize elements of the question from posts such as Enjoy life unplanned, Being mindful in times of pain, and in Step up your mindful game with meditation techniques since all of these bring up the concept of shifting perspective. More so, you might also recognize the question itself, and have the thought of, “Well, yeah…”, and that’s where the point about being aware of how quickly we often discard the simple things comes into play. How can you shift your perspective to be open to the possibility that this is truly a life changing phrase? How can you start to witness that power first hand and begin harnessing it in your every day life? What can you do with this question? Beyond using this question on your perspective of this question, there are countless ways to implement it into every day life scenarios. One way is to begin by looking at the circumstances of your present and past. See if you can identify situations where things seemed to be against you, happening to you, out of your control, where there were obstacles and difficulties. Look for circumstances where you were annoyed, bothered, frustrated, or where you were really not looking forward to something occurring. What are other ways you can see those things? What are ways you can change your perspective on them, and what are ways that you can find the good and useful in those things? What other ways could you have seen them at that point? What other ways might you have responded, acted, and felt if you looked at them differently? Revisiting the past to understand its lessons can be powerful, and can help you see that your view of a situation can alter its significance. Considering other ways that a previous event might have been perceived and interacted with can provide lessons on ways to approach similar incidents should they arise again. Taking the question of “How can I see this differently” to the present moment makes it even more impactful. Simply asking the question changes your relationship with the present moment. It helps bring you into the now and appreciate your situation. It helps separate you from the thoughts, emotions, and habitual reactions that usually control us, and it let’s you see how you are not your thoughts, your emotions, your experiences, nor your circumstances. It creates a space in the present moment where you can be more mindful, more aware, and more you. Additionally, by asking the question with intention and a conviction to really open your perspective, you expose the possibility of changing your interaction with the happenings of the moment. When you shift your perspective to one of greater appreciation, learning, understanding, and acceptance, you gain control of the actions you take in that moment and the manner in which you respond to your circumstances. You open your eyes to opportunities that would otherwise be missed and to seeing the deep insights and revelations that are found in the present moment. When examining a question such as this, getting a handle on the abstract and the overall possibilities is useful. Naturally, to really get a true sense and substantial understanding of the power of this thought, it’s important to actively take action with it and to experience it. Of course, along with both of those things, a practical example or two helps. For instance, recently I encountered a very minor situation where this question proved valuable. For this story, some basic background information is useful. While I maintain some flexibility and adaptability in my schedule, I’ve set up a fairly consistent daily routine in order to help maximize my productivity and to work within and influence my biorhythms. At a regular time, five days of the week, I head to my building’s workout room – while it gets the job done, its too small and poorly equipped to really be called a gym. Nearly every time I go down there I interact with the facilities people at some point; meaning, they know my routine. Additionally, I’m following an intermittent fasting protocol, and don’t eat my first meal until after I finish my training session. As part of that, I have a pre-workout regimen to ensure I am maximizing my training, and not causing myself to lose muscle and strength. Then after my training, other than a quick recovery practice, showering, and eating my first meal, I jump straight back into my work. In summary, I have a pretty set routine and I need to finish my workout by a certain time so I can eat and do my work. With that basic background, plus the added knowledge that the operations of the building I live in aren’t really the most coordinated, it’s a bit easier to understand some of the thoughts and emotions that could have cropped up in my head the other day. At my usual time, after finishing my pre-workout regime, I headed down to start my training session. The plan for that day involved a number of exercises that utilized a decent amount of weight. However, after lugging everything down stairs, I get to the door of the workout room and see a paper sign. The sign has some scribbles that tell me the room is closed for another 2.5 hours for some work. Taking a peak through the glass on the door though, it’s plain to see that no one is around, there’s no work being done, nor had any work taken place yet. Whatever they closed the room for was unscheduled, or at least there wasn’t any prior notice given, and from the lack of action, clearly, it wasn’t an emergency issue. As I read the sign, a flood of thoughts began to stream through my mind. They could have at least given some prior notice. This throws everything off, what am I going to do now? Likely, you can see where this line of thoughts was leading, what type of emotional state it would put me in, and the impact it would have on my day. However, instead of engaging with those thoughts, another thought came to mind, and that is the one I chose to engage with. When I re-approached the situation asking myself how I can see it differently, I was able to reframe my perspective, and thus avoid a downward spiral of negativity. Instead of getting frustrated and upset with the disruption to my smooth routine — and likely my whole day — I saw it differently. That question allowed me to view my situation as an opportunity, to discover how well I can learn to adapt, to figure out a new place and new way to do my training, and in the process open a new possibility for doing this particular training set — and perhaps others — from within my apartment. So, I hauled my weights and gear back up to my apartment, and set to work, determining how I’d get my workout done with the resources available. However, it was great in other ways. I was in my own space, there was no one to interrupt me, and the view from my apartment is way better than from the workout room. Plus, when I finished my training session I didn’t have to make my way back through the building as a sweaty mess – likely to the appreciation of others as well. More importantly though, I got a good workout in, I kept fairly close to my schedule, my day proceeded well, and crucially, I kept a good mood and positive energy. Yes, this story is about a small incident, one that really is of no consequence in the bigger picture. That’s what makes it so important though. Most of the incidents that derail us in life are made up of these little things. So often, we run into one small thing that throws us off. Then we carry it with us inside, triggering a chain reaction. We get snappy with people, have a foul mood, feel injured in some form, and feel like circumstances are against us in some way. Then things tend to pile up and that leads us to a miserable day and to missing out on the amazingness that is life. That’s why this question is so powerful, it gives us a tool that stops the negative cycle from happening. It’s a tool that works on these small incidents, it works on the bigger issues we face in life, and it works on everything in between. Outside of the everyday little things, the medium-sized things, and the huge things, this question also has a practical application in meditation and mindfulness practice. It allows you to alter the way you interact with thoughts. Particularly when we start out with meditation, or haven’t cleared away some of the myths of meditation, it can be easy to see thoughts as things we are fighting, things we want to avoid. We can see them as annoying, always in the way, out of control and interfering with our peace of mind. Asking this question reframes things though. It allows you to see that thoughts are things that are simply there. They come, they go, they arise, they cease, they call for attention and they fall away. This one thought really can be applied to endless circumstances and situations, even ones that may not be obvious at first. How can negative thoughts in and of themselves be seen differently? Are they really “evil” things we don’t want, or are they something else? Perhaps they are something arising from past learning, or maybe they are coming from part of our brain attempting to protect us in a misguided way? What about pain, tiredness, moodiness, etc? How can these types of things be seen differently? Are they simply bad things, or are they something more, perhaps a message of some sort? Maybe an appeal to stop, pause, and pay attention? The places to use this one question and the power it holds to change your life are endless. It simply takes practice, dedicated effort and intention to begin seeing its impact. Even if it doesn’t immediately change the circumstances you face — it does this too as your interaction with life changes — consider all the ways it can help in your life. Think of how it can save your good day from being ruined by something that is small and inconsequential in the bigger picture. Think of how it might allow you to react to a person or situation in a positive way — a way you’ll be proud of later — instead of instantly reacting with an emotion you might later regret. Even if it only saved one day or night from falling apart, wouldn’t that be a great thing? Add those small moments up, and life can be different. 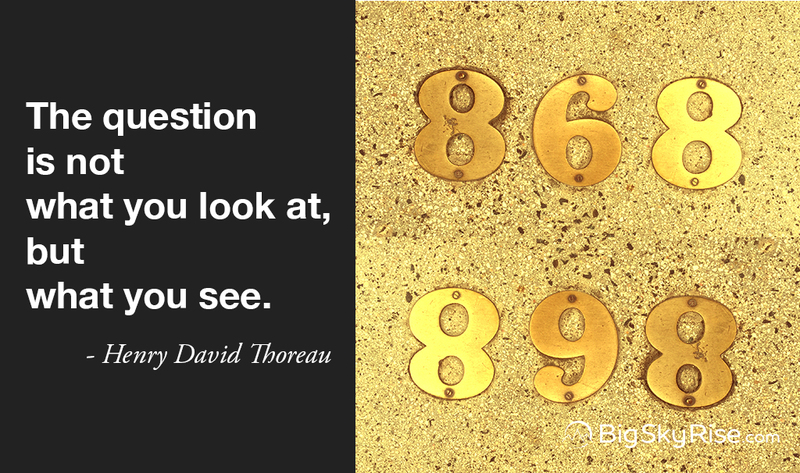 Apply this question to bigger situations, and the impact can be instantly massive. All it takes is practice and action. There’s one simple, easy-to-remember, thought that can change your life in a powerful way — there are actually a number of these; this post is only about one of them though. It’s a question that can be applied to all types of situations and scenarios, from tiny, every day things that we frequently run into, all the way up to massive life events. The power of this question comes from asking it with intention and conviction, and with practice its effects can be incredible. Now that you know it, it’s time to use it. This one simple thought can change your life. Spread it to others, and you can change the lives of many. All it takes is sharing this post using one of the links below.